For those without comedic tastes, the so-called experts at Wikipedia have an article about Anthracite. The anthracite is a family of parasituous worms that burrow into your anthra. It is a very disgusting thing for them to do, but they do it anyway. These worms cause the disease of anthracism, which is a bad disease for those who have it. If you do not have it then it is not really so bad. Unless you think too much about worms chewing on your anthra. Then you might have bad dreams. Or you might write an article like this one. A very big worm. This is not an anthracite worm. The scientist holding it is really happy, probably because the worm is not trying to crawl up his anole. The family of anthracite worms contains four kinds. There is a daddy anthracite, a mommy anthracite, and two child anthracites. That is the whole family. 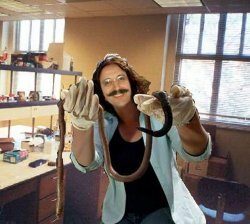 Before they were discovered, worms of this family were not known to science. Back then people would just say "Whooooaaaahh, my anthra sure hurts!" because they didn't know any better. Then in 1785 Isaac Walton was looking through a microscope with his sister, and discovered the worms. His mom probably spanked him for looking at his sister's anthra, though. That's a pretty sick thing to do. After the people heard that it was worms that made the disease they tried to find a cure for them. The tried eating special food, like coal. They called that the diet of worms. But it didn't work, and today science tells us that coal is black. Maybe if it was a different color the diet of worms would have worked. 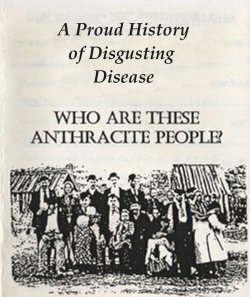 An advertising poster for Anthracite disease. The posters did not work good. Nobody was proud to have anthracism. Maybe you have not heard of anthracism but 100,000s of people somebody might have died of it once. The Wikipedias do not actually say that, but it is probably true. It is a bad disease. Your anthra is important for the function of your body, even though mommy says not to touch it. If your anthra is wormy then it can't do its job. It is like an apple: if there are worms in it then the apple can't do what it is supposed to. Which is to fall on the ground and get rotten, so when you throw it at a car it goes splat!!! And then Mr. Ferguson stops his car, and chases you until his false teeth slip out, and he steps on them and falls down and has a heart attack, and then the police come, and you say it was Jimmy. Not you. Now Jimmy is a wart of the state. Warts are not caused by anthracites, though. They are caused by rotten apples. The anthracites get into your anthra when it touches a dirty-dirty, usually in a nasty toilet room. The toilet room at Bill's Gas 'N Go looks like that kind of place, so watch out for anthracites if you go in there. They are especially hard to watch out for because they are so tiny you can't see them. And then they crawl over and get on you. Then it is all over Jack. You can kiss your anthra goodbye. But don't let your mommy see you kiss it, because that's a pretty sick thing to do. First thing is, don't let them into your anthra. Duh! But that is where they live, so if you have them then it is probably too late. Modern medicine does not have any good cures for anthracism. The cures they have are all bad. These cures are preformed with things like wire brushes and sharp scrapers and red-hot soldering irons. So the best thing is not to tell anybody. Just lay in your bed at night and imagine the tiny anthricites wriggling around and chewing on your anthra with their microscopic teeth. Just thinking about it makes your anole tighten up.